‘Jude’s Applied Actors were selected because of their track record of working to challenge discrimination and enable empowerment. The actors were completely believable in role and engaged the audience in some very thought provoking and solution finding problems. The portrayal of ‘Nick’s’ inability to help himself out of his problems brought tears to our eyes. We can write, direct and perform a piece of theatre focused on a variety of topics from a serious social theatre performance aimed at encouraging an adult audience to consider the impact of substance misuse to a fun packed adventure story to educated young people about healthy eating. Jude’s Applied Actors are professionals at using different styles of theatre to appeal to different age groups, abilities and experience. ‘Laura’ 2013, performed at the Regent Theatre as part of the Stoke College React Project. This play aims to raise awareness around the pitfalls of Door Stop Lending and alcohol abuse. Originally performed in 2006 at Manchester Metropolitan University for Wulvern Housings Groups AGM. ‘Stoppard and Beckett’ 2013, performed at Newcastle Under Lyme College and in 2011 at The Sandbach Methodist Church Hall. This is a comedy exploring the human condition. ‘Nick’ 2012, An adaptation of ‘Laura’, focused upon the vulnerability of an individual with learning difficulties to highlight the ways in which people can be exploited. This was performed for Aspire Housings Disability Awareness Event at Newcastle College. ‘Vicky’ 2012, a sensitive look at the impact of Mental Health issues upon individuals and their families performed at the Stoke on Trent Victoria Hall. 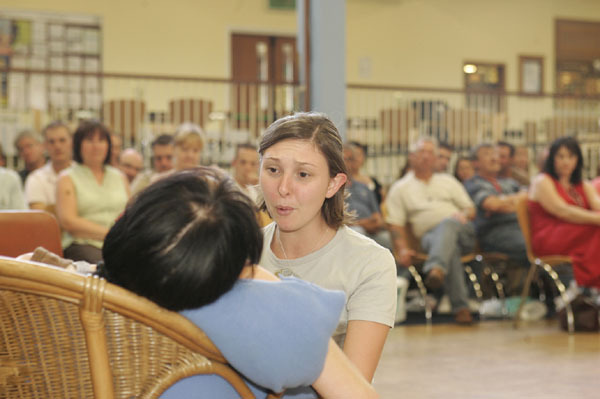 ‘Gemma’ 2011, performed at Jude Theatre Company’s Showcase looking at the difficulties people experience when borrowing money from ‘Loan Sharks’.